We have agricultural loan officers on staff. Because our agribusiness loan officers are committed to remain with this bank for years to come; because we are a locally-owned bank and our decisions are made in-house rather than in a far-away corporate office that is out of touch with agribusiness practices; because our loan officers are specialists in dealing with your total farm operation. Through our insurance agency we have all lines of crop and farm insurance available. "You know us, we know you!" In Agriculture, it is imperative that you work with the same banker year after year; one that can interpret Ag lending, farm programs and global trends. Dan Nicolai and his loan officers understand Ag lending and will stand by you and help you to prosper during turbulent or dynamic environments. This banking institution is home owned; the decisions are made on site by people who understand agri-business. At corporate banks, agriculture loan decisions are made at a central location where they completely lose touch with the customers they serve. 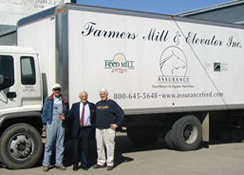 At this institution, Dan has been making Ag related loans for over 40 years. He and his staff are committed to Minnesota's farmers and its agri-business community. They know agriculture is the economic backbone of this state!